A green card is a document that allows you to be a legal permanent resident in the United States. This page details the general information, as well as links to additional and more specific information you may need during your application for permanent residence. Am I Eligible to File for a Green Card? Relatives of a United States citizen are eligible for permanent residence in the United States and may apply for the appropriate visa and green card. Depending upon how close a relative is they may be afforded an easier time with obtaining a green card. More information on family based green cards can be found here. You may wish to work within the United States as an immigrant and in this case you would apply for an employment based green card and your sponsor--instead of a family member--would be your employer. 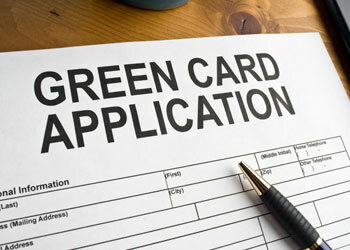 If you are looking for an employment based green card click here. Or, if you would like to work in the United States as a non-immigrant (meaning that you do not intend to be a permanent resident) . People attempting to escape political or religious persecution within their country should apply for a green card as a refugee or an asylee. If you have been granted either refugee or asylee status by the United States government you will be eligible to apply for a green card one year after you were given that status. If you are a refugee you must apply for permanent residence, but it is optional if you claim asylum. However, it is likely that if you have either status you might want to consider remaining in the united states on a more or less permanent basis. The victim of domestic violence by an American citizen abroad. It is important to note that you will still have to demonstrate that you meet the government's requirements for these various documents and if you are not able to your request will be denied. Being conscientious and attentive is imperative to the process. There are three ways by which you can apply for a green card: adjustment of status, consular processing and concurrent processing. You may already reside in the United States on a temporary basis and wish to become a permanent resident. If this is the case you would file for an adjustment of status. Which immigration petition you are supposed to file depends upon what basis your immigration is dependent upon. If you are immigrating on a family based green card you will need your sponsor to complete an I-130 form which is also known as a Petition for Alien Relative form. A work based green card will require your employer to send in a completed I-140 form which is also called a Petition for Alien Worker form. Humanitarian green card programs do not require a petition. Special immigrants are to file an I-360 form which is also termed a Petition for Amerasian, Widow(er), and Special Immigrant form. Before you file your I-485, the Application to Register Permanent Residency or to Adjust Status form, you will need to apply for and receive a visa in your appropriate category. Next, be sure to file the I-485 form correctly, otherwise it may end up being rejected and wasting your time, money and effort. Also, it is possible that an incorrectly filled out I-485 may preclude you from future applications especially for reasons of fraud or dishonesty. Every applicant under the age of 79 must pay an $85 fee for biometric collection. This is a total of $1,070 for most applicants! Making an error on this form would be most unpleasant! Then you will be photographed, fingerprinted and your signature will be recorded at an Application Support Center. This is for the purpose of verifying your identity and supplying necessary information for your background check. The information gathered during this step will be compared to the information you provided in the previous steps. You might have to attend an interview with a USCIS official, but this is not always necessary. USCIS will contact you if you need to come in for an interview and what you will need. A written decision will come to you in the mail. If you have been denied your application there will be a written reason. Say you want to apply for permanent residence outside of the United States, in this case you cannot apply for an adjustment of status. Rather you would have to go through consulate processing. This means that your application for a green card would be submitted to the consulate or embassy within or near your country of citizenship. Similarly to the adjustment of status process you must first identify what your basis of immigration is and then have your sponsor file the appropriate petition. And immigrants claiming refuge or asylum do not need to petition for immigration. USCIS will notify you whether or not your petition was accepted and if you can proceed to the next step of obtaining a visa abroad to enter the United States. You will then be notified by the National Visa Center about what you need to do in order to get your visa. Including any associated documents, procedures and fees. If a visa is available you will then go to your nation's consular office for an interview in which the interviewer will determine whether or not you will receive a visa. You should then receive your visa in what is known as a visa packet. It is exceedingly important that you not open this packet. The only people allowed to open it are officers of the Customs and Border Patrol. Then, when you are in the United States you will receive your green card in 30 days in the mail. If you do not receive it in this period of time you should contact the United States Citizenship and Immigration Services customer service department. Note: Keep in mind that any changes in your living situation or regarding your application should be submitted to the National Visa Center. Certain categories of immigrants may file concurrently. This means that you can petition for immigration, register your permanent status, submit all required documentation and pay all of the fees at the same time. Or an abused spouse or child as long as the abuser is a United States citizen or if the visa category is not used up. Please note that you must be within the United States to file concurrently. Although immediate family visas have no limit to how many may be granted, all other immigration visas do. These limitations depend upon what country the applicant is from as well as an overall cap. There are only 226,000 visas distributed for family based applications and 140,000 visas for work based applications per year. If your visa is considered one of the preference categories you must wait until your priority date becomes current. Only when that date comes up are you allowed to actually apply for the immigrant visa. Your priority date is included in Form I-797 which is the form that your sponsor filed on your behalf. If you are neither a permanent resident nor a citizen, but still wish to work, especially when waiting for your green card, you will need to obtain an Employment Authorization document by filing the I-765 form. This document is good for one year and then you will have to renew it. The earliest you can apply for a new EAD is 120 days from its date of expiration. You will also need to undergo a medical examination to be granted permanent status in the United States. This medical examination must be completed by a doctor who is designated by the USCIS as a civil surgeon. You must contact the USCIS to find one of the approved doctors so that your examination will count towards all the necessary requirements.